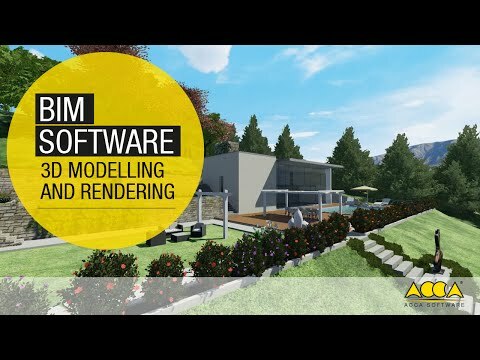 Edificius-LAND is the landscape design software for gardens, outdoor spaces and terrain modelling.With Edificius-LAND get professional results even if you’re not an expert about landscape design software. In no time you can produce detailed drawings of your garden or exterior spaces design completing them with animated video and renderings. With Edificius LAND you can address garden design, public and private parks, landscape architecture and exterior spaces design in general, therefore anything connected with urban and public spaces planning. You have specific BIM objects at your disposal to produce renderings and beautiful project presentations. Roads, Yards, Shed structures, Stairs, Ramps… allow you to easily model the necessary objects for garden and exterior spaces design. Landscaping design projects can reach a high level of detail when using advanced parametric objects specifically developed for landscape design such as terrain profile pavements, exterior stair sets and ramps with railings, fences, gratings, gutters, sidewalks and kerbs, barriers, landscaping walls, etc. Even the flowerbed and swimming pool are at your disposal as parametric BIM objects for modelling. The Tree object also offers realistic photographic representations of a wide selection of trees, bushes and plants. Edificius LAND already comes with an archive of trees and many others can be downloaded from the continuously updated online catalogue. With the Vegetation object, speed up the modelling of vegetation: Enter multiple objects “Tree” (trees, bushes, plants, etc ..) of different types on a specific area or along a path. The vegetation is automatically distributed randomly on the terrain profile (density, plant size, etc.) for a truly realistic modelling. In addition to the online catalogue, you can easily import 3D models of trees, shrubs and plants in many other external formats, such as SketchUp (*.skp), Collada (. *dae/*.Xml), 3D Studio Max 3DS (*.3ds). Edificius LAND, automatically generates a graphic image and a silhouette for each 3D model and a 2D block for the “Tree” object for a clean representation in both elevation and plan views. Edificius LAND supports full management of simple and complex objects (also in IFC) of any type. With Edificius LAND quickly rebuild a complex topographic land survey working plan view or in directly in 3D. Get highly professional results in a very intuitive way with terrain contour lines, landscape plans, topo plans and height nodes. Contour lines and topographic contour plans provide efficient and precise terrain modelling tools by means of known altitude values (iso-lines) or by means of triangulations with vertices at known altitudes (contour plans). The height nodes also allow precise fine tune modelling adding terrain details (such as small soil depressions or localized mounds). Even import topographic land surveys from DXF/DWG land surveys to model the terrain automatically to be even more accurate and fast. After simple straight forward steps you get a 3D model of the terrain on which you can start working with specific landscaping BIM objects. With Edificius LAND, easily model your terrain, intuitively and with great simplicity, directly in the 3D landscape modelling environment. Define earthwork phases and organise them into project levels (earthworks, cut & fills, backfills, etc.) and automatically assess the relating data with regard to surfaces and volumes of soil being moved. Such data is vital when preparing BoQ documents. With BIM design integrated with Real Time Rendering you can finally deal with exterior architecture assessing the results of your design choices in real time and produce realistic and professional project presentations. The Edificius LAND catalogue contains a wide range of furniture and decorations for exterior spaces design and their representation. Import other objects available in other standard formats and enrich them with HD materials and colours (3D textures) to increase realism and produce exceptional graphical results. The archive also contains HD plants and vegetation with embedded motion for viewing in real time.